Even though I’m back in town, I’m still in vacation mode, taking a few extra days to clean up some of the things I never seem to have time to tackle. 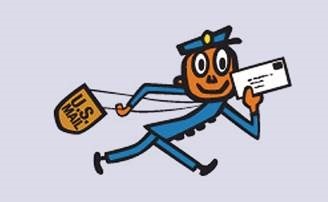 I’m procrastinating on a couple of household projects, so I thought I’d catch up on email. I don’t get anywhere near the email that Mr. HIStalk gets, but I have trouble keeping up nevertheless, so tonight we’ll dip into the reader mailbag. I was driving to work the other day listening to the local public radio station. As usual, the “commercials” were just brief blurbs read by the station’s on-air personalities. What caught my ear was the fact that athenahealth was advertising. Do you think they get much business from that kind of exposure? That’s a great question. It certainly can’t get the company any less exposure than some of the EHR ads that I see in medical practice journals. You know what I’d really like to see, though? Jonathan Bush being interviewed by Car Talk hosts Tom and Ray Magliozzi. The amount of scattered random thoughts would be truly amazing. I liked your recent piece on downtime. Here’s something that has helped our clients be prepared. Thanks for sharing your video on the downtime-ready printers. It looks like it can work with minimal training and being able to access the downtime reports using proximity badges makes it easier for those of us who don’t want to remember one more password. I smiled when I saw the “Tray 2 Empty” indicator on the printer’s touch screen – it seems like every printer I encounter lately ends up needing paper. I work in a busy ER and we have a lot of locum tenens physicians that cycle through. There is this hysterically funny blonde that recently started working with us. 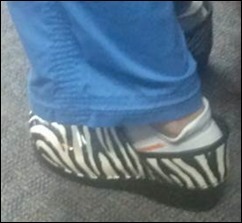 When I saw the zebra print clogs, it occurred to me that you might be working in my ER. Am I right? Although I’m definitely a fan of Corky’s, I am not currently walking in Memphis. I’ll let you know if I come your way, though!